Karan Chandhiok, considered by many to be the rising star of India’s antitrust bar, heads the slick competition practice at Chandhiok & Mahajan. The firm started out as a competition boutique in 2013, but has since grown to a full-scale law firm with a strong antitrust group. As of August 2018, the firm has three competition partners and 12 associates. Chandhiok says figures provided by the CCI confirm that the firm has worked on the largest number of recent leniency applications – besides those lodged in auto parts matters – which highlights the number of fresh cases in which the team is taking instructions. He is leading Hyundai Motor India’s appeal before the NCLAT against a $13.54 million fine that the CCI imposed after scrutinising tie-in arrangements between Hyundai and its dealers and handing down its first substantive resale price maintenance decision. He also represented Big Tree Entertainment in an abuse of dominance probe. In deal work, the firm advised chemicals producers Clariant and Huntsman on their $20 billion merger of equals; Wirecard on its purchase of Citibank’s merchant acquiring business, which was cleared in Phase I; and Venture Lighting on its acquisition of GE’s lighting business in India. The team also advised Integra LifeSciences on its $1 billion buyout of Johnson & Johnson’s neurosurgery business. Chandhiok crosses to the other side to represent the CCI in certain cases before the new National Company Law Tribunal as well as the Delhi High Court and Indian Supreme Court. 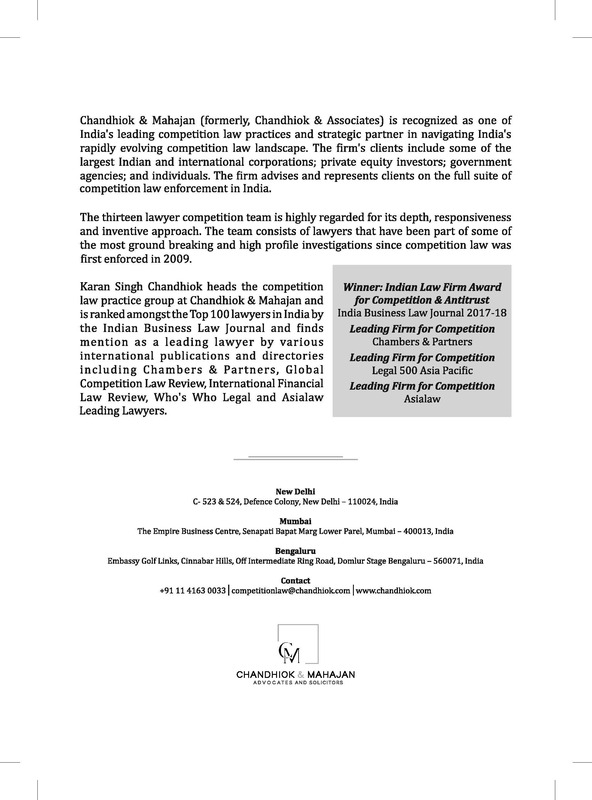 Chandhiok & Mahajan (formerly, Chandhiok & Associates) is recognized as one of India's leading competition law practices and strategic partner in navigating India's rapidly evolving competition law landscape. The firm's clients include some of the largest Indian and international corporations; private equity investors; government agencies; and individuals. The firm advises and represents clients on the full suite of competition law enforcement in India. The thirteen lawyer competition team is highly regarded for its depth, responsiveness and inventive approach. The team consists of lawyers that have been part of some of the most ground breaking and high profile investigations since competition law was first enforced in 2009. Karan Singh Chandhiok heads the competition law practice group at Chandhiok & Mahajan and is ranked amongst the Top 100 lawyers in India by the Indian Business Law Journal and finds mention as a leading lawyer by various international publications and directories including Chambers & Partners, Global Competition Law Review, International Financial Law Review, Who's Who Legal and Asialaw Leading Lawyers.